Welcome to our new series, The Five Senses In Singing! For the next five weeks, we will be examining how the five senses – sound, sight,smell, taste, and touch – are all related to singing! Our ability to hear is one of the most obvious senses involved in singing. It’s also one of the most important senses! In order for singers to be proficient in music, they need to have excellent hearing. But not just any kind of hearing. Trained singers, and other musicians, listen to music in an entirely different way than most people. Music is made up of many layers of sound, and singers are trained to ‘sort’ through those layers and to highlight the most important aspect of music. When singing in choirs, singers rely on the other choristers around them to enhance their sound, and so they must listen very carefully to the voices of the other singers surrounding them. This is especially true when the music has many different vocal parts. Intonation, the ability to sing in tune, is essential for a singer, and it requires an intense focus when listening to the music, and modifying one’s own sound to match. A singer’s ability to be self-aware is essential when focusing on hearing. It is not enough for a singer to listen; they must be aware of how their own sound fits into the greater sound around them, and adjust themselves accordingly. So, what do you think? 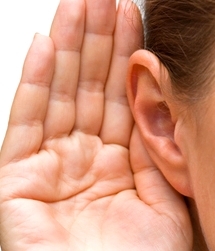 What are other reasons why hearing is an essential sense in singing?